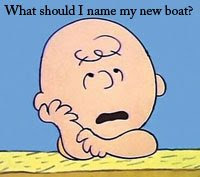 Boat Names - the Blog: Does Charlie Brown have a boat? Does Charlie Brown have a boat? This real life "Charlie Brown" does have a boat, and he needs a name for it. Please read his message and post boat name suggestions below. Sounds like a nice boat! message: Need a name for runabout 1950 bayliner classic. Our life is our grandkids. Wife name is Edith.